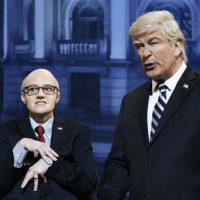 NBC/Will Heath(NEW YORK) — Alec Baldwin was back on Saturday Night Live this weekend, reprising his President Donald Trump impersonation for the cold open, in which Trump frets his ongoing trip to Argentina for the G-20 summit. “I keep having a nightmare where I’m walking through a forest of blood,” Baldwin’s Trump tells his wife Melania – played by SNL’s Cecily Strong. “That was just my Christmas decorations,” Melania responded, referring to the now-infamous red Christmas trees adorning the White House. “God, I want to fire you Rudy, but I can’t – you know all my secrets,” says the faux president. “I keep those secrets where no one can find them — on nationally televised interviews,” the faux Giuliani responds. Trump then phones ex-lawyer Michael Cohen, a role reprised by Ben Stiller, who answers with, “Michael Cohen speaking, I’ll tell you anything you want.” Cohen, of course, pleaded guilty to lying to Congress earlier this week. “Because you were like a son to me,” Trump deadpanned. Next, Beck Bennett’s shirtless Russian President Vladimir Putin, joined by ex-cast member Fred Armisen as Saudi Crown Prince Mohammad bin Salman. The two shared a host of secret handshakes, alluding to the real life bro-shake their counterparts shared at the G-20 summit. The sketch ends with the group joining Baldwin for a parody of “Don’t Cry for Me Argentina” from the Broadway hit Evita — apparently an actual favorite of Trump.